Introducing the Adventure Theme. 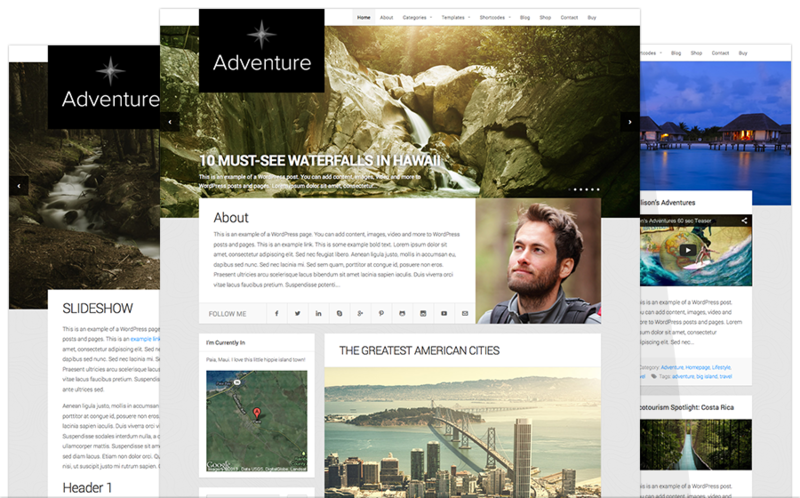 A beautifully crafted, responsive and retina optimized WordPress theme designed for sharing your life adventures. The theme was created with travelers, explorers and adventure related businesses in mind. The new theme is built using our new Seed Theme framework, and features lots of goodies like a responsive framework, retina optimized design, social media options, font icons, shortcodes, WooCommerce and Gravity Forms compatibility and much more. The theme is also compatible with the Google Maps Widget plugin for displaying your location or current whereabouts in the sidebar. In addition, a full-width featured slideshow on the home page displays prominent posts — grabbing the attention of viewers. The Adventure Theme is guaranteed to impress! For an entire website solution, don’t forget to try our Auto Install form to purchase the Adventure Theme with 3 months FREE hosting using the promo code “INSTACOOL”. Learn more here. Hello! Is the Google Maps widget exclusive to the adventure theme or will I be able to use it on the ‘Fresh’ theme I have just bought?